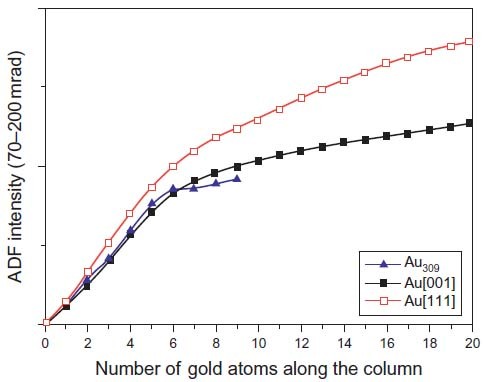 In Figure 2575a, multislice simulation presents the total cross section of Au (gold) as a function of the number of atoms in a Au column. In other words, the HAADF intensity depends on the atomic number (Z-contrast) as well as the number of atoms in the column. Without the need for a calibration standard, LeBeau et al. were able to quantify the number and location of the atoms in the specimen from 4 to 33 atom column height when the experimental images taken from a wedge-shaped Au thin foil was compared directly with theory. Mkhoyan et al. applied multislice method to simulate the angular distribution of scattered electrons at different thicknesses of amorphous Si specimens in STEM imaging. Under the optics conditions described in Figure 2575b, only ~60% of the original beam reachs the BF (bright-field) or EELS detector after passing through 100 nm (marked by the red line) of an a-Si specimen if a 21.5-mrad collection aperture is used, and only ~30% if an 8.5-mrad collection aperture is applied. Note that in EELS mode, the collection aperture normally refers to, for instance, the entrance aperture of GIF detector. α -- The convergence semiangle. Figure 2575c. Diameter of the probe irradiation with specimen thickness t.
For instance, Figure 2575d shows the spatial resolutions at convergence semiangles 7 and 15 mrad, respectively, based on Equation 2575. Note that such convergence semiangles are used in many TEM systems. Figure 2575d. Spatial resolutions at convergence semiangles 7 and 15 mrad, respectively, based on Equation 2575. Jiang J. Structural characterization and investigation of the growth mechanism for the pentacle nanowires. PhD Thesis, Tsinghua University, 2009. LeBeau JM, Findlay SD, Allen LJ, Stemmer S. Nano Lett 2010;10:4405–8. measurements in STEM, Ultramicroscopy 107 (2007) 345–355. Huai-Ruo Zhang, Ray F. Egerton and Marek Malac, Local thickness measurement through scattering contrast and electron energy-loss spectroscopy, Micron 43 (2012) 8–15.